This book is a must read for anyone deploying BusinessObjects. It covers everything from planning your upgrade to the latest release, to best practices in universe design, and powerful report creation that maximizes business insight. This book covers the most frequently used features for the full BI suite, in one comprehensive book. There’s in depth coverage of Designer, security via the Central Management Console, InfoView, Web Intelligence, and Desktop Intelligence. It goes beyond step-by-step instructions to cover how and why in a business context. Transition notes are interspersed for version 5 and 6 customers to understand the biggest changes in XI Release 2. 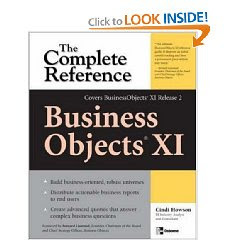 If you drive BI requirements in your company or are a data warehouse program manager, Business Objects administrator, report author or consumer, this book is for you.